A beast with "teeth that would have made a T. rex whimper" had been known only as "Predator X." It's official: A giant, marine reptile that roamed the seas roughly 150 million years ago is a new species, researchers say. The animal, now named Pliosaurus funkei, spanned about 40 feet (12 meters) and had a massive 6.5-foot-long (2 m) skull with a bite four times as powerful as Tyrannosaurus rex. "They were the top predators of the sea," said study co-author Patrick Druckenmiller, a paleontologist at the University of Alaska Museum. "They had teeth that would have made a T. rex whimper." Combined with other fossil finds, the newly discovered behemoth skeletons of P. funkei paint a picture of an ancient Jurassic-era ocean filled with giant predators. 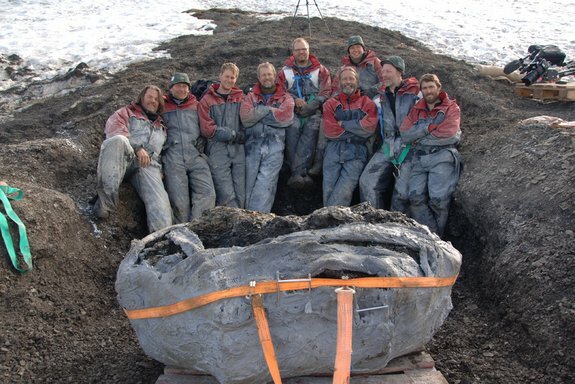 The huge pliosaur fossils had to be cast in plaster before being removed from the Svalbard site. Now, after years of painstaking analysis of the jaw, vertebrae and forelimbs, the researchers have determined that Predator X is in fact a new species, and they have officially named it for Bjorn and May-Liss Funke, volunteers who first discovered the fossils. 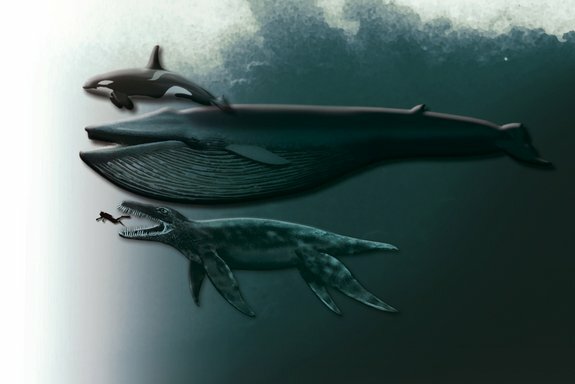 The pliosaurs, marine reptiles that prowled the seas 160 million to 145 million years ago during the Jurassic period, had short necks, tear-shaped bodies and four large, paddle-shaped limbs that let them "fly through the water," Druckenmiller told LiveScience. The new species likely lived closer to 145 million years ago and ate plesiosaurs, related long-necked, small-headed reptiles. The new analysis shows P. funkei had proportionally longer front paddles than other pliosaurs, as well as slightly different vertebrae shape and different spacing of teeth within the jaw, Druckenmiller said. A size comparison of a killer whale, blue whale, a Pliosaur (Predator X), and a human diver. In 2008, scientists initially estimated that Predator X could have been up to 50 feet (15 m) long. The current study suggests the creature is smaller than that, but still bigger than the largest living apex predator, the killer whale, which tops out at about 30 feet (9 m) long, Druckenmiller said. The Pliosaurus funkei fossils were just two of nearly 40 specimens discovered at the Svalbard site. In the Oct. 12 issue of the Norwegian Journal of Geology, the authors also describe two new ichthyosaurs, or dolphinlike reptiles, the longest-necked Jurassic-era plesiosaur on record, and several invertebrates. Together, the fossils suggest an ancient Arctic sea teeming with fearsome predators and invertebrate fauna, said study co-author Jorn Hurum of the University of Oslo in an email. "It's not just that we found a new species, we've been discovering a whole ecosystem," Druckenmiller said.